David Lloyd George, 1st Earl Lloyd-George of Dwyfor,[a] OM, PC (17 January 1863 – 26 March 1945) was a British Liberal politician and statesman. As Chancellor of the Exchequer (1908–1915), Lloyd George was a key figure in the introduction of many reforms which laid the foundations of the modern welfare state. His most important role came as the highly energetic Prime Minister of the Wartime Coalition Government (1916–22), during and immediately after the First World War. He was a major player at the Paris Peace Conference of 1919 that reordered Europe after the defeat of the Central Powers. He made a greater impact on British public life than any other 20th-century leader, thanks to his pre-war introduction of Britain’s social welfare system (especially medical insurance, unemployment insurance, and old-age pensions, largely paid for by taxes on high incomes and on the land). Furthermore, in foreign affairs he played a leading role in winning the First World War, redrawing the map of Europe at the peace conference, and partitioning Ireland. His main political problem was that he was not loyal to his Liberal party—he was always a political maverick. While he was Prime Minister he favoured the Conservatives in his coalition in the 1918 elections, leaving the Liberal party as a hopeless minority. He became leader of the Liberal Party in the late 1920s, but it grew even smaller and more divided. By the 1930s he was a marginalised and widely mistrusted figure. He gave weak support to the Second World War amidst fears that he was favourable toward Germany. "Lloyd George" redirects here. For the American federal judge, see Lloyd D. George. For the American politician, see Lloyd R. George. In this multi-word name, the family name is Lloyd George, not George. 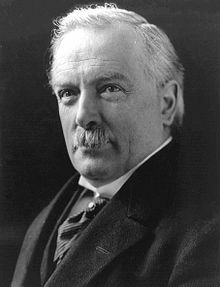 David Lloyd George, 1st Earl Lloyd-George of Dwyfor,OM, PC (17 January 1863 – 26 March 1945) was a British Liberal politician and statesman of Welsh parentage and upbringing. He made a greater impact on British public life than any other 20th-century leader, thanks to his pre-war introduction of Britain's social welfare system (especially medical insurance, unemployment insurance, and old-age pensions, largely paid for by taxes on high incomes and on the land). Furthermore, in foreign affairs he played a leading role in winning the First World War, redrawing the map of Europe at the peace conference, and partitioning Ireland. As Prime Minister, Lloyd George favoured the Conservatives in his coalition in the 1918 elections, leaving the Liberal Party a minority. He became leader of the Liberal Party in the late 1920s, but it grew even smaller and more divided. By the 1930s he was a marginalised and widely mistrusted figure. He gave weak support to the Second World War amidst fears that he was favourable toward Germany. He was voted the third greatest British prime minister of the 20th century in a poll of 139 academics organised by MORI, and in 2002 he was named among the 100 Greatest Britons following a UK-wide vote.